The Theme of the 2015 exhibition was “We Are the Bridge” in which we aimed to discover how artists creatively envision themselves, their culture, faith, community, and art being a bridge from conflict to resolution and reconciliation. 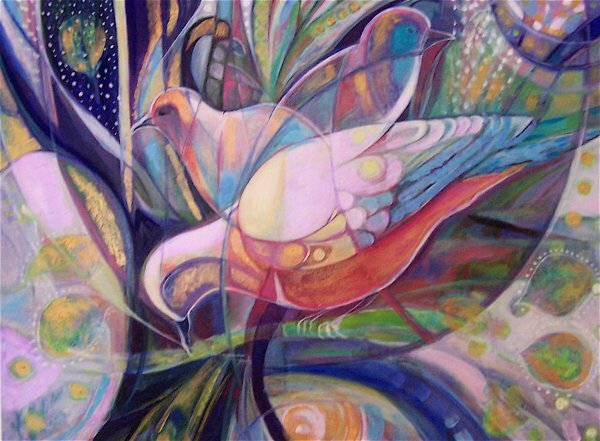 We accepted artwork that expresses the theme and a commitment to interfaith understanding, coexistence, peace, and cultural dialogue. On this page you can view the online gallery of the “We Are the Bridge” exhibition based on the alphabetic order of artists' first names. 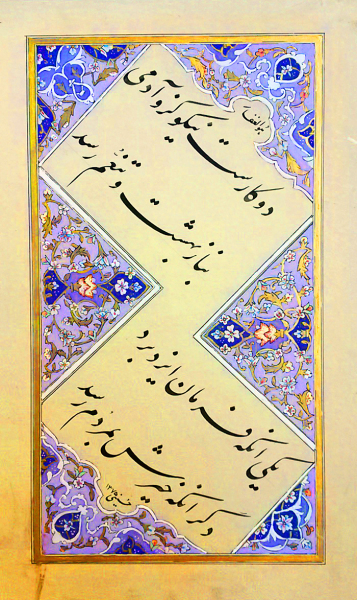 Description: This piece is a calligraphy inscription of part of the Verse 13 of chapter 49 of Quran in Nastaliq style (the predominant traditional style in Persian calligraphy). The verse is saying that: “O mankind! We have created you from a male and a female, and made you into nations and tribes, that you may know one another. Verily, the most honourable of you with Allâh is that (believer) who has At-Taqwa (most pious). 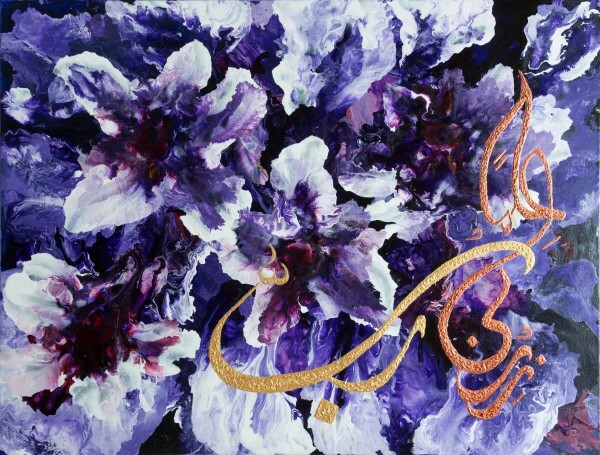 The artist believes that knowing that the best person is the pious one can help the hearts get closer to each other and cease many fires among different faiths and nations. 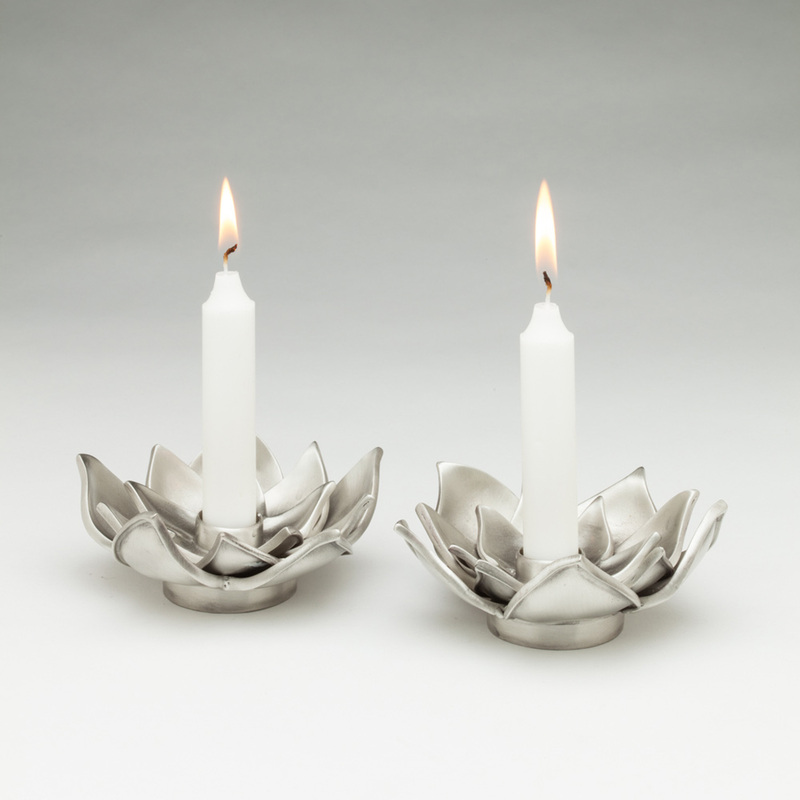 Lotus Flower Shabbat Candle Holders l 4 x 4 x 1.5"
Description: The lotus flower is a symbol often used as a visualization in meditation, especially in Hinduism and Buddhism. As it blooms pure and clean out of mud, it has come to mean purity-- of mind and body, beauty, prosperity and strength. I see meditation as a way to rest, and find your own still quiet voice. Lighting special candles on Friday nights to thank God for light and usher in a day of rest (Shabbat or Sabbath) is a wonderful Jewish tradition. 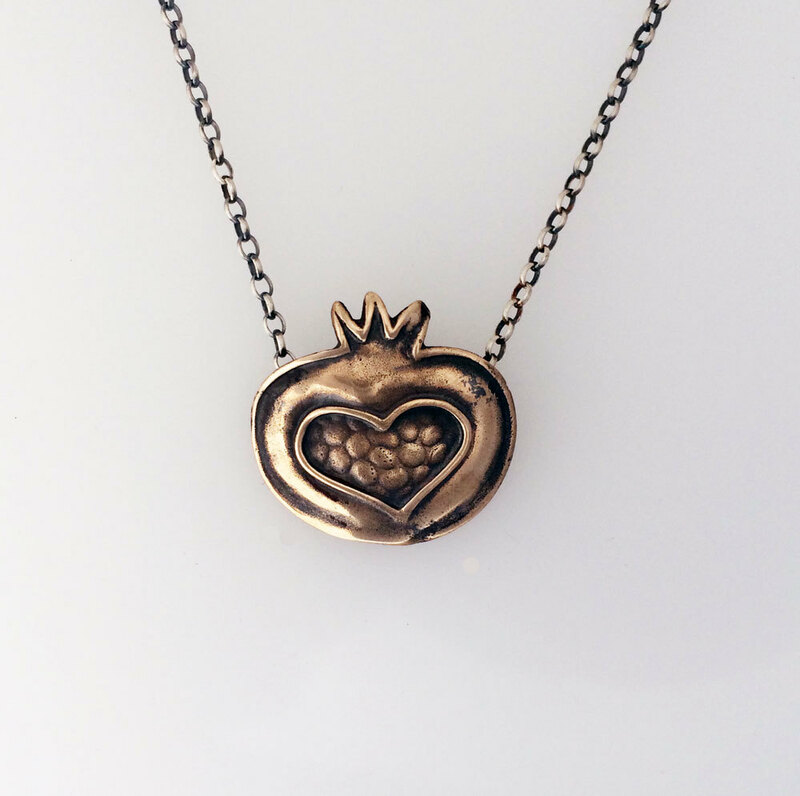 Pomegranate Sacred Heart Necklace l 1 x 1"
Description: The pomegranate is a long-standing symbol in Jewish tradition. Originally mentioned in the book of Exodus, it represents Fruitfulness and Righteousness: the bountiful seeds of a fruitful life that grow into spiritual bonds with something larger in this world. The symbol of the Sacred Heart is a heart that has suffered in the past, yet is still alive with love, light, and warmth. It is a symbol of fortitude, rebirth and unconditional love. These ideals are blended in this beautiful and symbolic necklace. 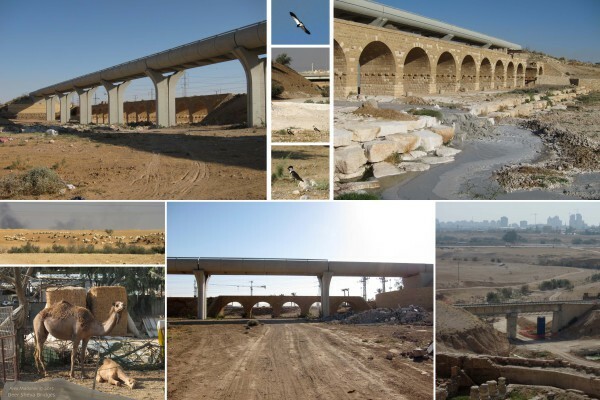 Beer Sheva Bridges l 13" x 19" x 1"
Description: “Beer Sheva Bridges” combines images I captured while riding a bicycle from Beer Sheva to Tel Beer Sheva and Tel Sheva at the end of May 2012. My wife's colleagues at Ben Gurion University provided the bicycle and filled us in on some of Beer Sheva’s modern history as the unglamorous outpost city that grew up on the edge of the Negev. Tel Sheva was the first of the towns established by the Israeli government in an effort to settle the traditionally migratory Bedouin tribes, and it was not a great success. Description: The theme of the exhibition inspired me to depict unity in my art work. Therefore, I decided to make some sculptures that illustrate people who have become united despite their different beliefs. This art work depicts the people that have received messages from their prophets and have evolved over time. They have decided to put their differences aside and join each other in worshiping God. Elements of The Universe l 24"x 60" x 2"
Description: “A universal Truth: Earth, Space, Water, Fire, and Wind are the elements solely responsible for the very existence of this universe.” These five elements are considered very important in our faith. I can connect: Earth for modesty, Wind for being progressive, being everywhere spreading love, knowledge and happiness, Fire depicted by Sun, for passion to succeed, Space a huge place, huge heart that could incorporate everyone, and Water is for love, for life. These can help shift the personal energy and help bringing harmony everywhere. The painting inclusive of all these elements, show “we all being interconnected through these elements”. Circle of Life l 48"x18"x2"
Description: "Circle of life is a nature's way of taking and giving back life to this universe. Circle of life symbolizes the universe being sacred and divine. It signifies infinite nature of energy. Description: The artist think selflessness is one of the main roads from conflict to peace and reconciliation. This is why he has chosen to inscribe in Kufic calligraphy a verse from Hafiz’s (a famous Persian poet and mystic in 14th century) poem which seeks selflessness from his Beloved saying that You come and take away my “self” so that when you are here, there is no “myself”. 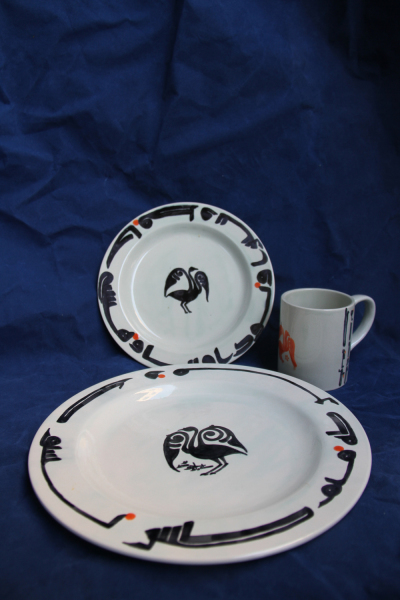 The style of these ceramic wares is inspired by Nishapur ceramics (9th-12th century, Iran) in which master potters and designers created hundreds of utilitarian wares decorated with detailed Islamic-style floral and geometric decorations and Kufic calligraphy rooted in Sufi practices and traditions. 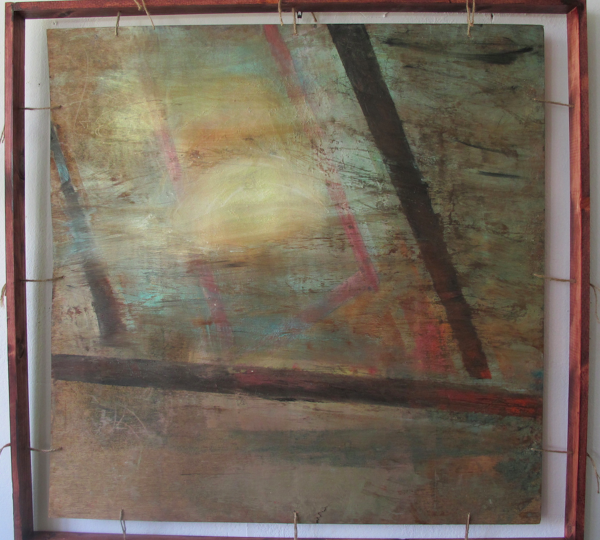 Description: From conflict to resolution: The story is in the chosen materials of found plywood, oil, oil paint, and ground up minerals. Conflict over resources and resolution through coming together through understanding the complexities of being. 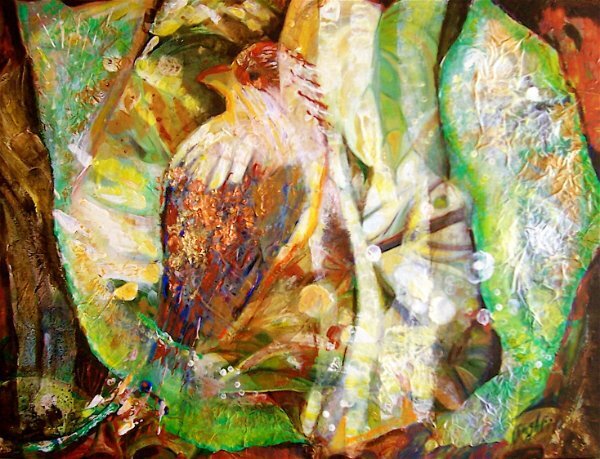 Emerald Way l 36" x 48"
Description: This art work gives the message of peace. There is only one power who showers his blessing on mankind. Description: Celebrating spring with the bird motif in the deepest green ,impressing the love of nature. Description: Inspired by the peaceful mood of doves and the silence of winter, I tried to create the impression of rest and peace. Description: Working together is success. The world is for everyone. We will make connections through peace and prosperity. Mikveh: A Bridge to Spiritual and Personal Transformation l 58" x 39"
Description: Mikveh is a bath used for ritual immersion in Judaism since Biblical times. Traditionally, women immerse after menstruation and childbirth and before their weddings and men and women before conversion. Today, some use mikveh immersion to mark other spiritual journeys. The ritual entering and leaving the mikveh becomes a bridge, granting the time and space to acknowledge and embrace a new stage of life. Our waters, maayim chaim (living waters), enter the mikveh with words of pain and leave serenely. 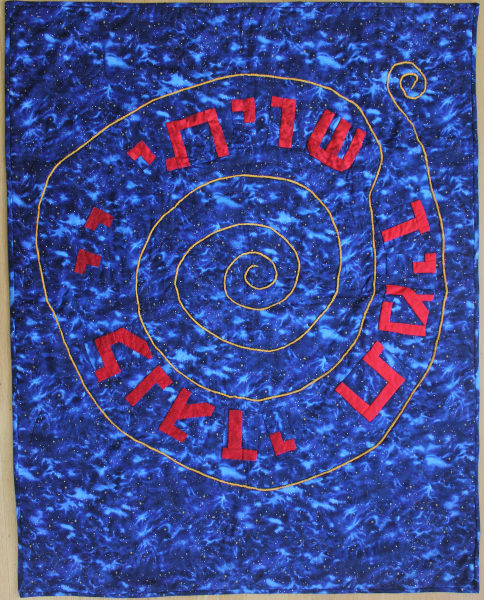 Shiviti Adonoi LeNegdi Tamid l 41" x 50"
Description: "The Hebrew phrase “Shiviti Adonoi LeNegdi Tamid”: “I will place the Lord before me at all times”, from Psalms 16:8, appears on many Jewish amulets.We placed the words in a spiral on dark blue, star-filled fabric to emphasize the global nature of prayer and the universal omnipresence of God. The couched yarn becomes a bridge into the infinity of the universe, expanding the mystical, labyrinth of God being in front of us always. Description: Bill Carmel met Shokoor Khusrawy in his "Little Gallery" on Main Street in Pleasanton, CA. This friendship became collaborative in these artworks. 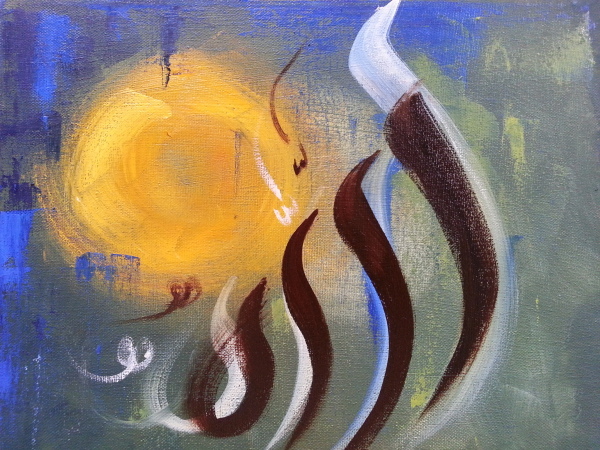 Bill admired Shokoor's calligraphy and proposed that Bill's abstract paintings could serve as a companion to the calligraphy. Shokoor agreed. This is an example of how a difference in language, culture and religion can be overcome by the creative process. Description: Bill carmel met Shokoor Khusrawy in his "Little Gallery"on Main Street in Pleasanton CA. Their friendship became collaborative in these artworks. 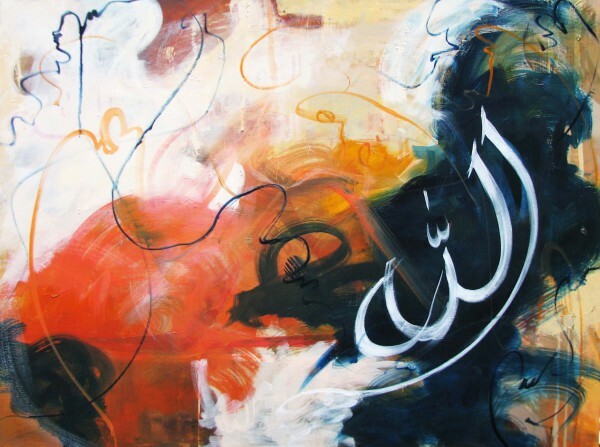 Bill admired Shokoor's calligraphy and proposed that his abstract paintings could serve as a companion to the calligraphy. Shokoor agreed. This is an example of how differences in language, culture and religion can be overcome by the creative process. 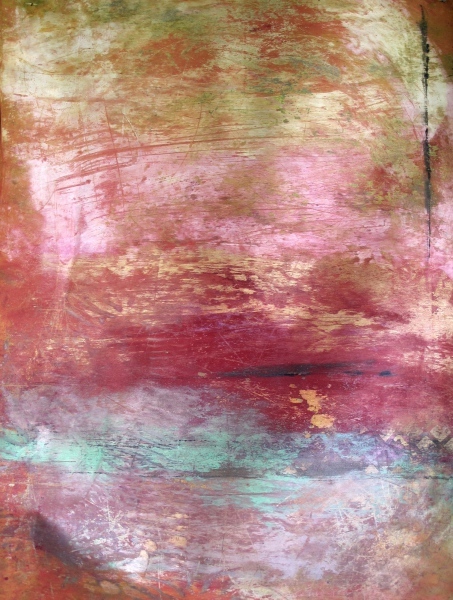 Description: This is an experimental piece, using poured glazing liquid to create texture. 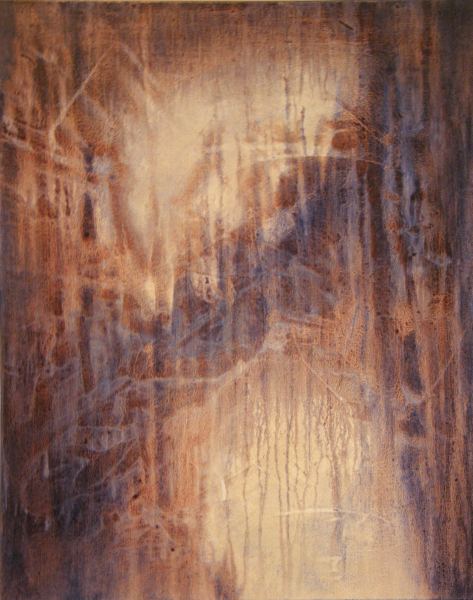 The paint adhered to the texture in ways that created what I see as a bridge over a canal or river. Shapes of buildings can be seen on either side. My work is always intuitive and spontaneous. I choose the support, then the texture for the support, the palette and the basic composition. The results are most often a painting that abstracts nature. In this case, mostly made by man. Whether we reach each other via a bridge such as this one, or a bridge of shared experience or loving kindness does not matter. It is only important that we build and cross them. Womb of Compassion l 15"X15"
Description: This painting came to me in part during a class on mysticism and the New Universe Story, during which we were encouraged to imagine names for the divine that reflect a contemporary consciousness. 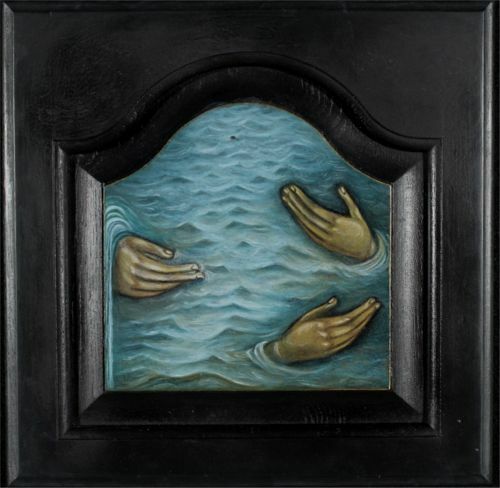 This painting is also inspired by the somewhat unorthodox Orthodox icon of the Mother of God with three hands, as well as by my own experiences of being caressed by our sister, Water. What are your names or images for the transcendent? Where to Look (#2) l 18" by 14" by 5/8"
Description: Judaism teaches me that to find God, I must be kind to people. Particularly the ones I dislike. 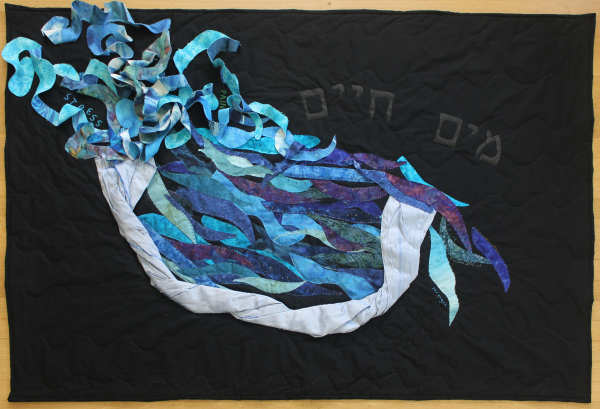 My quilt is inspired by Rebbe Nachman of Bratslav, (1772-1810), who said, “The whole world is a very narrow bridge, and the most important thing is not to be overwhelmed with fear”. When we commit to interfaith dialogue and reconciliation, we must not be overwhelmed by fear, but walk straight ahead, on our own narrow bridge. Description: The hashtag BlackLivesMatter has been everywhere after Ferguson and most recently after the South Carolina homicide. 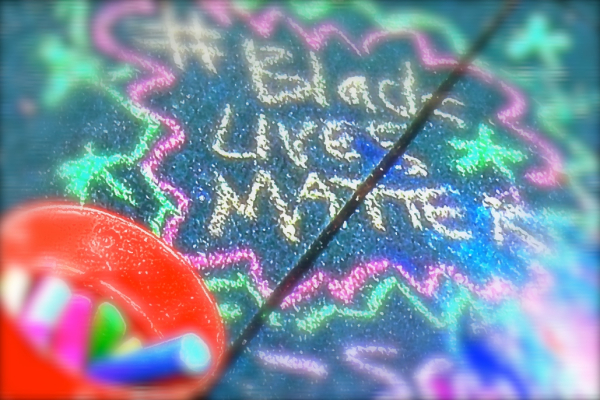 Here it was found as sidewalk art on MLK Day 2015 in San Francisco. In this work I have attempted to create a physically permanent and creative record to this electronic, social media theme. I have also attempted to focus attention on this simple truth through digital enhancements to the message and blurring of the periphery. This hashtag becomes a credo for how we can all be the bridge towards justice and peace as we affirm our common humanity towards one another. 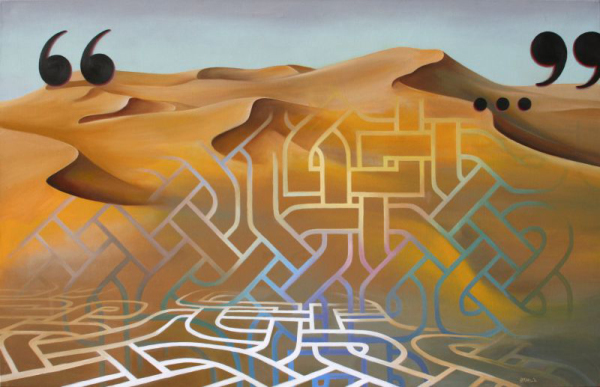 Description: This piece is about the interconnectedness that binds everything in existence, as well as the 'beyond words' feeling of awe that the desert landscape offers to its seekers. Description: Believing that music calms the savage beast. 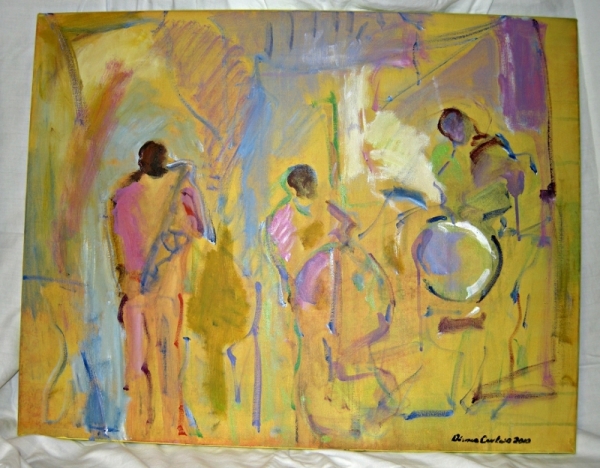 This piece represents the calmness of the body through music.